$26.99 & FREE Shipping on orders over $59. 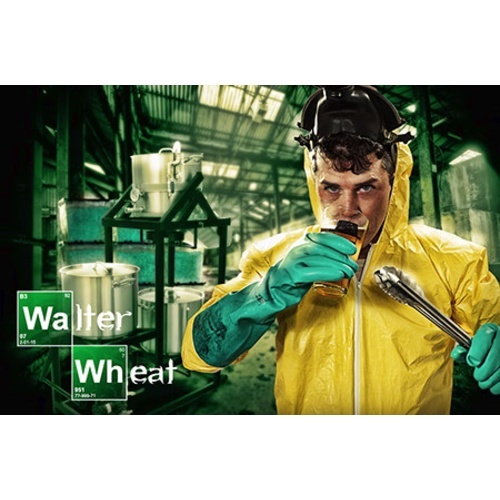 Start brewing bad with Walter Wheat! The ultimate wheat beer that you can make legally... at home... without robbing a train to get the ingredients. We perfected our secret formula but unlike W.W., we are willing to share. We started with a tradtional wheat malt mixed with regular malted barley to get that perfect wheat/barleyblend. Then we left tradtional and added some modern scientific twists that might just set the standard for Wheat Beers. 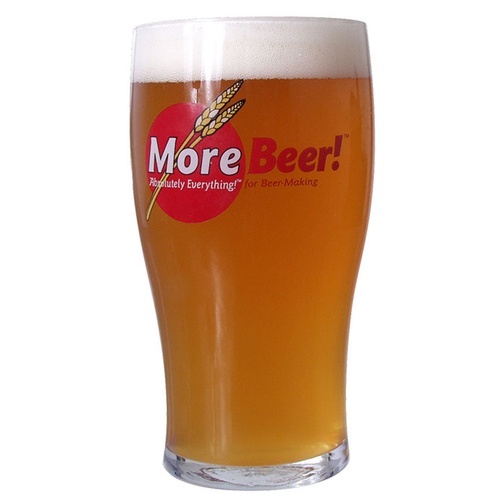 We use acidulated malt and melanoidin malts to add malty crispness (yes malty crispness). Our super complex hop list of Simcoe, Cascade, and AMARILLO® hops put a lot of pop in this beer. And then of course we had to mellow it out a little with a dose of Crystal hops in the finish. The super secret ingredient? Ok, ok we'll tell you that too.... Brewing Bad Rock Candy added at the end of the boil. These blue raspberry sugar crystals lend a raspberry flavor that completely blends in to add complexity, depth, and we think a little pizazz, but in no way over powers the beer. 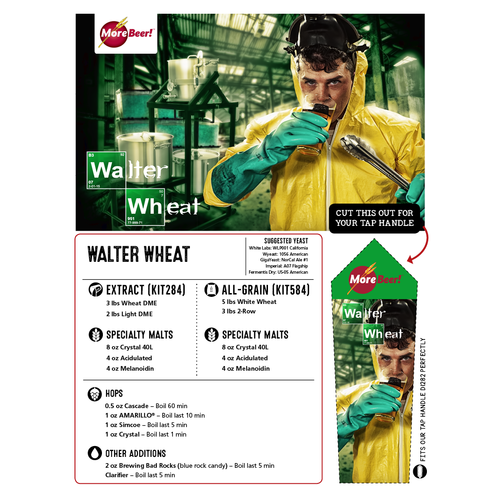 You won't be thinking Raspberry Wheat, you'll just be wondering how you can get more. Note - The recipe kit will come with 2 oz of the raspberry rock candy, but if you'd like to add more that will need to be ordered separately from the options below. I have already brewed this product once and has been requested for a birthday party. Made it previously, and it's excellent. I rack it onto a gallon of lemonade and make a shandy. I wanted a wheat beer to make raspberry flavered beer with. I love this Kit - super easy and easy to flavor. Looking for a wheat beer with a little bit of fruitful flavor. Also liked the customization comments from some of the customers. I added another pound of DME to this extract kit to give it a boost. I can't bring myself to put the candies in there tho. I've brewed the All-grain twice but didn't have time and need something in the keg. Extract came out way better than expected. 1.053 down to 1.014 in about 6 days, chilled and kegged 6 days after that. Just opened one it was really good. I have done this kit several times, each time I have modified it in some way. I have added fruit, beets, you name it - every beer turns out great. Let me start by saying this is a pretty tasty beer. This one needs a little extra time after bottling to sit. When I first tasted it, it was more like a session ipa than anything. The more I let it sit, the better it tastes. At no point, however, have I thought this tasted like a wheat, nor did I ever get any hint of blue raspberry. Maybe I’m not the best judge of what a wheat should taste like being mostly a hop head. It’s good, but I won’t be doing it again. The first time I brewed this, sampling as I racked to secondary, I quickly decided I preferred to cut the edge on this just a bit by adding some frozen juice concentrate. Have done Apple/Mango/Peach in one batch, Pomegranite/Cherry in another, and love the results. This is a really great recipe kit - I've made it four times now. Instead of using the rock candy, I've started adding Coriander, Grains of Paradise and lemon peel to it, and turning it into a summer ale. The most recent batch I kegged with lemonade and made a shandy, and it came out fantastic. I tweaked this a little - I gave the rock candy to my kids and used lemon zest, coriander and grains of paradise instead, and it's one of the best kit beers I've ever made. It also makes a very good shandy - I put about an once and a half of lemonade in a pint glass and pour onto it. I have brewed this twice. The first time I added rhubarb in fermentation and it turned out great. The second time I used rasberries and it was again a great beer. This makes a great base for adding flavors and the candy an interesting back note. I will keep brewing this beer. Fun wheat beer to brew nice hops line up. Just tried the first bomber really nice aroma, and finish. Good beer to chill in the heat with. I did add more rock candy and some raspberry extract at the end of the boil. Nice little hint to the beer as you drink it you have this moment you ask yourself is that fruit? ABV came out around 5.2%. I think I will get a little wild and try it with 2-3 lbs of whole raspberry next time to see what happens. I wanted to see what I could do with some added fruit, so I followed directions but then added 36 ounces of crushed raspberries on day 14 of fermentation and allowed it to ferment another 12 days before bottling. While I normally am not a fan of "fruity" beers, it turned out very well and I will probably repeat it in the future. There is a tart and distinct raspberry favor with good level of hop flavors still coming through. The ABV ended up being 5.3%. We just drank the first bottle and it is very good. I added 12oz of rhubarb to the secondary which gave it a nice fruity sourness. A great summer ale. This is one i will make again. This is a good recipe kit, and for the price, it can't be beat! The raspberry candy doesn't really add anything. I wish they gave you a little more of the candy as the amount they provide isn't enough to get the any flavor from it. Overall, I am enjoying the brew. It's super easy drinking and very light, and I'm glad I made it. I'll be enjoying this one all summer long! Very tasty, refreshing and light. I tried this kit based on the brewing concept of 'why not?'. I am a little disappointed that I don't get any flavor from the blue raspberry at all. (Perhaps if it had more than a couple ounces of rock candy some flavor would come through even slightly in the finished product?). But the brew itself is a winner! Light, crisp and easy drinking. Even my wife likes it because of the nice floral tones. I will do this one again.